I couldn’t wait for spring. I’ve already started cleaning out the freezers. Who knew I had accumulated so many parmesan rinds? Time to make broth! If you have just a couple of rinds, you can throw them into most any soup or stew—not just minestrone—to add depth. If family life (or life life) keeps you from your rinds beyond their metastasis, you can brew a full-on parmesan broth. I pressure cooked the cheesy stock for 20 minutes and was rewarded with an indulgent infusion, perfect for a catch-all slow cooker risotto-style side dish. (I will warn y’all about the goopy pan residue. But we’re in the mood for cleaning now anyways, right?) Making my way through a frozen cache of roasted spaghetti squash, plus some stashed barley, I came up with this autumnally nuanced, comforting blend. With a composition more veggie than grain, this recipe keeps it light enough for spring time. 2/3 cup organic pearled barley. I buy barley in bulk. Remember to bring your own container. 2 cups cooked local spaghetti squash. I recommend roasting. I just roast the whole thing on a baking sheet at 350º until it collapses. I scrape out the pre-shredded flesh with a fork and freeze what I won’t be using soon. 3½ to 4 cups good broth. 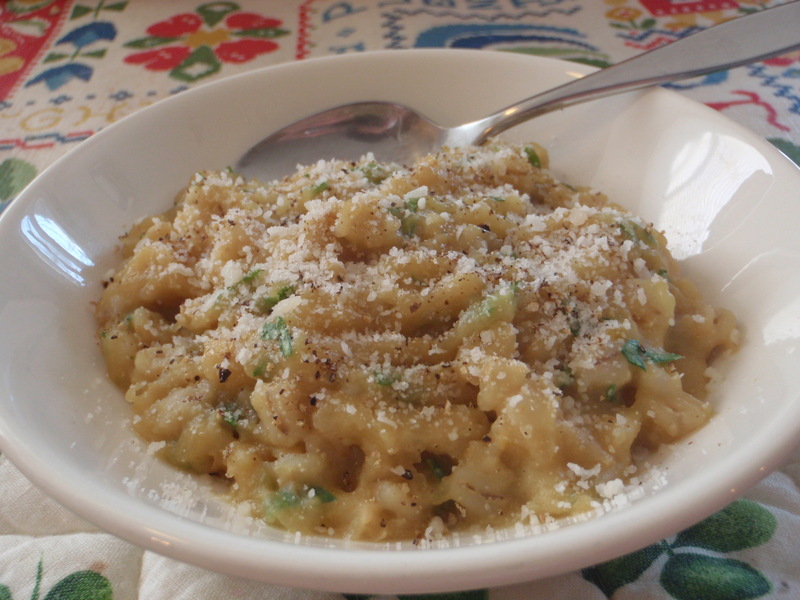 Reggiano broth works very well for this recipe and keeps the dish vegetarian. one sprig of fresh backyard sage. This heady herb’s easy to grow. Give it a try! ½ teaspoon salt. I like Real Salt. Put everything except the parsley in the slow cooker and cook on LOW for 3 to 3½ hours, until the barley is done “to your own tooth.” Stir in parsley. Serve with grated Parmigiano-Reggiano or Texas’ own Veldhuizen parmesan, available from Greenling‘s local food delivery service. The house smells great right now. I’m brewin’ up some pepper broth (finally!) with the frozen bag of pepper trimmings that has rested undisturbed since the last local bell graced our kitchen—some weeks ago, at least. Before a friend enlightened me about her family’s practice of distilling sweet peppers’ essence from the stems, seeds and ribs, I had always tossed the remains into the compost. What a waste! Now the pepper parts warrant their own freezer bag. Augmented by the occasional onion end (not too many, please), the bag broths up savory and deeply aromatic, with nary a meat scrap or bay leaf. Taking it easy on myself (somebody has to), I just dump the capsicum contents into the crock and slow cook ’em on HIGH for a couple hours or so. The mouthwatering fragrance fills the air with a delectable scent that promises a delicious dish ahead: Dai Due sausage and rice. Again? Yes. Thankfully, again! And an easy Indian-style cabbage side for a bonus. You’ll be using 2 separate large skillets for this two-pot meal. Remember you can purchase most spices in small amounts from your grocery store’s bulk department. I bring in my own containers. 4 Tablespoons ghee. I make my own ghee from Organic Valley butter. Click for instructions. 1 Tablespoon high smoke point oil, preferably organic. I like Spectrum‘s oils. 1 local or organic onion, halved and thinly sliced pole to pole. Hillside Farms, at the Sunset Valley Farmers Market, was still selling reds and yellows the last time I checked. a couple of thin quarter-sized slices of organic ginger root. I almost never peel fresh ginger. Handle your own root as you please. 1 bay leaf. Get growin’! pinch of turbinado sugar. I buy this in bulk at Central Market. Heat 2 Tablespoons ghee in a large (12″) skillet over medium heat. Add the onions and ¼ teaspoon salt (I like Real Salt) and stir and fry until the slices are well browned. Remove pan from burner and replace with another large skillet (not nonstick here). Heat it up on HIGH and add the tablespoon of oil followed quickly by the sausage links. Brown the sausages on both sides . Place the links on a plate and set aside (they shouldn’t be cooked through). Set the pan aside, as well. Transfer the onions to a separate plate and put the onion pan back on the burner over medium heat. Add the remaining 2 tablespoons ghee and the spices and toast them until they smell good and roasty to you. Add back the onions plus the ginger slices and drained (and rested) rice and stir and saute until the rice grains glisten and separate. Pour in the soaking liquid (use 1 2/3 cups) and sugar plus another ¼ teaspoon salt, turn the heat to HIGH and bring to a boil. Place a tight-fitting lid on top, lower the heat to lowest and cook for 10 minutes. 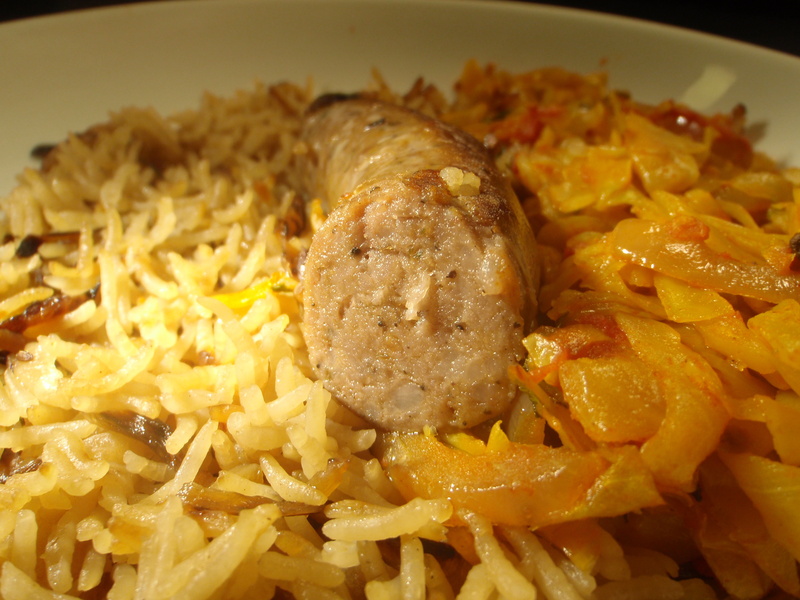 Quickly remove the lid, slide the sausages on top of the rice and replace the lid. Continue cooking for another 10 minutes. Remove from the heat and let rest 10 minutes before fluffing the rice and removing the whole spices. Serve with the cabbage. This easy cabbage preparation, revelatory in its combination of caraway and cardamom, plays cross-cultural ambassador with the Indo-European flavors of the kielbasa and rice. heaping ¼ teaspoon cardamom seeds (from green cardamom pods). You can buys these already popped out of the pods (decorticated) but I just crack the pods and pick them out myself. 1 cup organic canned whole tomatoes, crushed. I use a potato masher for this. If you didn’t stock up on Muir Glen when it was on special recently, you can find Whole Foods 365 brand and Central Market brand organic canned tomatoes at reasonable prices. half a 3-pound local cabbage, outermost leaves removed if tough, cored, quartered and sliced into shreds. You’ll find plenty of affordable Texas-grown cabbage at our farmers markets and local grocery stores. ¼ teaspoon garam masala. Click for a recipe. several Tablespoons fresh chopped local cilantro, easy to find right now. Try growing your own. Tis the season, before it gets too hot. Heat the ghee in the sausage skillet on medium heat. Add the whole spices and fry until toasted to your taste. Add the onion and saute until softened. It’s quite alright (and deliciouser) for the onion to pick up some brown patches. Dump in the ground spices (except garam masala), give ’em a stir and then add the tomatoes and garlic. Cook and stir until thickened, then add the cabbage and salt. The pan will be very full. Continue to cook, stirring frequently, until the cabbage is wilted to your liking. If the sauce sticks to the pan and browns a bit, that’s fine. Just add a few tablespoons of water to deglaze. The tomato fond will enrich the dish, deepening the flavors. When your cabbage is cooked, remove the pan from the heat and stir in the cilantro. Correct the salt if necessary and serve. Our half-pound hunk of Dai Due‘s savory salt pork, hacked into slim slabs and rendered crisp, didn’t even reach the bean pot. We munched every last baconey strip. Herbal and meaty, sumptuously marbled, Richardson Farms pork belly is spun into gastronomical gold by alchemist Chef Jesse Griffiths. As the crunchy distillation yielded about ½ cup of luscious pig fat, the crème de la gras, plenty of bean-enhancing magic remained. Sign up for the Dai Due weekly e-newsletter so you can pre-order locally sourced creations from their imaginatively compiled offerings. Then pick up your goods at the Saturday Austin Farmers Market, or try your luck and just show up at their booth to see what’s still available. Impeccably seasoned, with no MSG or nitrates added, and sustainably produced, these meats will righteously fortify your cooking. 1 package (½-pound) Dai Due salt pork, cut up as you please. 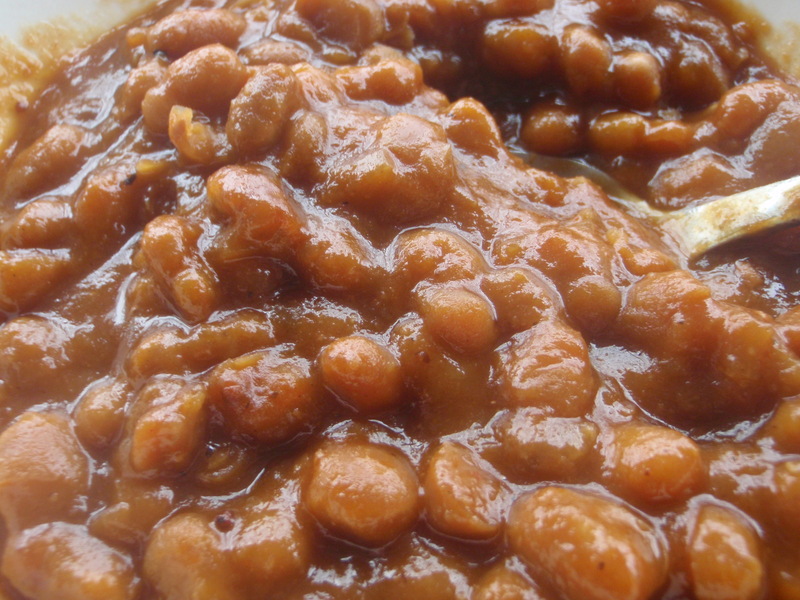 1 pound organic navy beans or great northern beans, soaked 8 hours (or overnight) and drained. You can do this a couple days ahead and store the beans, well sealed, in the refrigerator. I buy these bean varieties in bulk at Whole Foods. Remember to bring your own container and get the weight tared at the front desk. 2 medium local or organic onions, chopped. Hillside Farms at the Sunset Valley Farmers Market is still selling red and yellow onions. 2 bay leaves. Try growing this easy bush. ¾ cup organic tomato puree or sauce. If you didn’t stock up on Muir Glen during recent sales, check Whole Foods and Central Market’s store brands for a good value. In this last batch of beans I used the leftover puree from draining canned chopped tomatoes for pizza. Some folks use ketchup. People that put tomato products into their baked beans are not from Boston. It’s up to you! 1/3 cup turbinado sugar or organic brown sugar. Central Market’s own brand is usually the best buy. 1 Tablespoon organic coarse grain mustard. Ditto on the CM brand. 2 teaspoons salt. I use Real Salt. 2 teaspoons organic apple cider vinegar. Whole Foods 365 brand sells for less. Render the salt pork. Start the pieces out in a cold pan and fry over medium heat to cook them evenly . Drain, saving the fat, and return several tablespoons of grease back to the pan to saute your onions. Cook your onions until translucent, adding the bay leaves and thyme about halfway through. Dump the onions, drained beans and the remaining ingredients into a Dutch oven (’bout 6- or 7-quart size) or your slow cooker crock. You can add the cooked salt pork, too. We devoured ours, though! Either place your Dutch oven into a preheated 300º oven and bake, covered, for about 4 hours (stirring halfway through) or set your slow cooker on LOW and cook for 4 to 6 hours. Either way, check for adequate liquid and add more (very hot) water if necessary to avoid scorching your frijoles. When the beans have cooked and tenderized sufficiently, stir in the vinegar. If the sauce needs further thickening, remove the cover (for either cooking method) and continue to cook until as thick as you like. Taste for salt, sweetness and tang and adjust as required to please your palate. We like to serve our baked beans with plenty of fresh cracked black pepper. Once again my favorite local charcuterie source seasons my beans. Dried legumes, even organic, are a bargain as well as nutritional gold. So you can afford delicious, sustainable and good for you meat when you stretch its flavor with versatile beans. A half pound of Dai Due‘s seriously smoky tasso (hewn from local pork and crafted without nitrates) can fortify a good two pounds of dried black-eyed peas (or the pulse of your choice) or fancy up your feijoada for posher prandials. 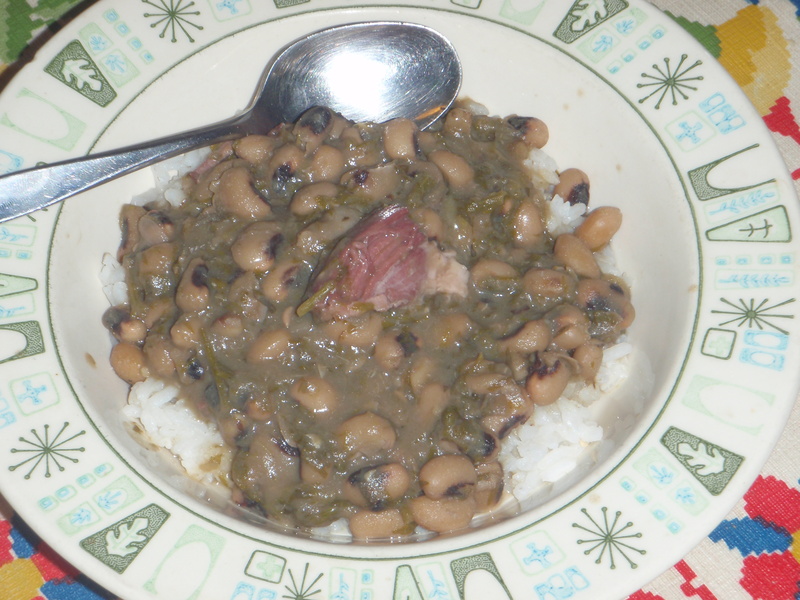 My last batch of hoppin’ john included a pound of organic black-eyed peas (from Whole Foods bulk department. I bring my own bag. ), Texas leeks, local carrot tops (always cut off the tops before storing your carrots, but don’t throw them away! ), domestic organic garlic, a home grown bay leaf and that fragrantly meaty, smoky tasso, seared for Maillard’s sake, all crocked up in the slow cooker on HIGH for a few hours. I added a splash of organic apple cider vinegar (WF 365 brand is usually the best buy) towards the end. Remember to salt at the beginning of the process, to fully salinate the beans and facilitate even cooking. Serve over cooked Lowell Farms Texas grown organic jasmine rice with lots of freshly cracked black pepper and pickled hot peppers or hot sauce, if you please. Cornbread plays friendly here, too. We love beans. Inexpensive, nutritious and filling, legumes also take top honors for tastiness. Most every culture boasts a beloved bean dish or two. And many plant-centric cuisines offer multitudinous manifestations of leguminous medleys, from India’s diverse dals and China’s breadth of ingeniously transformed pulse products, to the frijoles (of Three Sisters agricultural and numismatic fame) of the original Americans. While I certainly appreciate an elaborate cassoulet or feijoada, and have amused my family’s palates with various homemade incarnations of Indian treats such as dosas, idlis, badas and badis, I usually keep my bean cookery fairly simple, as in straightforward brews of Texas field peas (see “Hoppin’ Jean“), Indian dal purees (I particularly enjoy mung dal), or often just adding a can of cooked garbanzos, kidney beans, or white beans to sautés and stews. 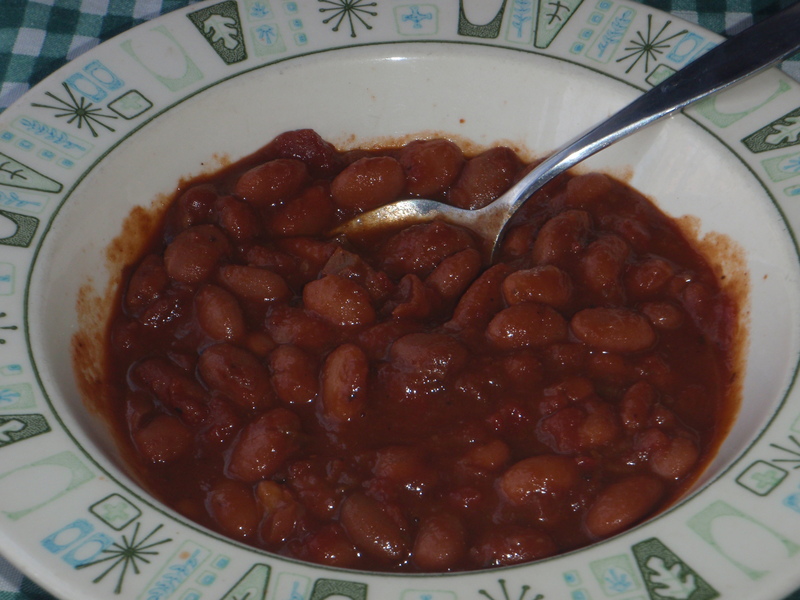 Here’s an easy seasonal bean dish to put your slow cooker to good use. 2 ½ cups organic dried pinto beans, picked through for pebbles. I buy these in bulk at either Central Market or Whole Foods. 3 Tablespoon tasty fat. Bacon grease is perfect, of course, but any good animal fat will work, as will olive oil for a vegetarian version. 1 large or 2 small or 1 ½ medium (you get the idea) local and/or organic onions, chopped. 1 good-sized local bell pepper, whatever color’s at hand, chopped. I just bought some shiny organic red/green marbled beauties from Milagro Farm at the Austin Farmers Market. Or use an equivalent amount of other local sweet peppers. 1 spicy chile, such as a jalapeno or serrano, halved, seeds and ribs removed if kids will be partaking. Use more chiles and leave the innards in for the NC-17 crowd. 1 bay leaf—try growing your own. The plant will survive cozily in a pot if necessary. Ours has thrived organically outdoors for years. 2 or more cloves of garlic, minced. I prefer more but garlic tolerance is very personal. When I can’t find local (it’s mostly, if not all, gone for now), I purchase domestic organic. 2 teapoons good quality chili powder. I mix my own. See recipe. 1 28-ounce can organic crushed tomatoes, preferably fire-roasted. You can briefly whirl canned diced or whole tomatoes in your food processor for an interchangeable texture. 2 teaspoons salt. I like Real Salt. WF sells it in bulk. Soak the beans overnight (at least 8 hours) in cold water. Drain and rinse them. If you can’t cook them right away, they’ll keep, covered, in the fridge for up to four days. Don’t oversoak them (24 hours or more), however. The skins will toughen and the insides will fall apart. Heat your fat in a Dutch oven or other very large (6-quart is good), wide pot. Saute the onions and peppers with the bay leaf until softened. Add the drained beans and continue to saute until your ingredients pick up some brown spots. Stir in the garlic and let the fragrance bloom. Add your dried seasonings and stir a bit. Add the rest of the ingredients and turn the heat off while you get your slow cooker ready. Plug in a large (6-quart) slow cooker and set it to HIGH heat. Carefully pour your bean mixture into the crock and add enough water to cover the beans by about one inch. Give it stir, put a lid on it and cook it all day. If you’re passing throught the kitchen at about half-time, go ahead and stir it again, quickly replacing the lid. These beans can take up to 9 hours to cook through, as the acidity of the tomatoes slows softening. Later in the cooking, if the beans appear threateningly dry, add a little more water (hot water, please!). When your beans are tender and cooked, correct the salt if needed. Serve with fresh-cracked black pepper and spicy chiles. Roll ’em up in a corn tortilla or swipe at ’em with a homemade roll. In the interest of frugality, and not just some innate compulsion (someone I know might disagree), I save all kindsa scraps. Stored in a plastic bag in the freezer, my collection can include everything from the usual meat trimmings, bones, onion ends, carrot tops and leek greens, to rejected apple and pear chunks, parsley, celery and mushroom stems, gingerroot parings, fresh fennel prunings, and the occasional fresh dill snippings. I let my stash grow until, much like the Blob, my bag refuses to fit into its quarters and the other frozen residents lemming out onto the floor. Then I make homemade stock. I’m not brewing a French mother sauce here, so my cavalier method serves our kitchen well. biggish bag of scraps. Meat scraps contribute a more savory taste to your jus. a couple whole garlic cloves, maybe a sprig or two of fresh thyme. A few peppercorns and a clove are fine. Put all the ingredients into your slow cooker. You’ll need enough scraps to fill your crock to the brim. If your trimmings are frozen, keep in mind that they’ll shrink down as they thaw, so don’t be afraid to pack ’em in. Pour in enough water to just cover your clippings, put the lid on the cooker and turn it on to High. If the weather’s hot, don’t forget to set your stock project outside in a safe spot, to keep that heat where it belongs. Let it cook for about an hour, then lower the heat setting to LOW, and just let it simmer about 12 hours, give or take a couple hours. It should smell terrific! When the time’s up, strain your stock. If you have pets, at this point they will be keenly interested in your work. Actually the aroma of the bubbling broth will have already driven them to following you around the house all day. Depending on the species, they may stare at you with pleading eyes, or constantly rub against your legs. That’s love! I use a large colander set over a bowl to first spoon out the large pieces. Then I pour the remaining liquid through a fine mesh sieve—actually I use a splatter screen, a cheap choice you can find at most any thrift store. Let your broth cool to close to room temperature. The wider your bowl (or other vessel—I sometimes use a couple of aluminum roasting pans to speed things up), the quicker the cooling. If your house isn’t frigid, get a fan blowing on your bowl. When your distillation is ready for refrigeration, lay a piece of plastic wrap directly onto the surface of the liquid. After chilling in the fridge, the fat that has risen to the top will adhere (mostly) to the wrap and you can peel it off. I normally save this fat for cooking. Poultry fat lends great taste to stir-fries. And of course, if you’ve included some fatty ham bits in your infusion, you know what cured pork fat can do for your cooking! You can use your broth right away, or store it for a few days in the coldest part of your refrigerator. I usually pack my stock into containers and put them in the freezer. Honey, I shrunk the Blob! Fresh and flavorful local potatoes are all over our markets lately. If you’ve yet to taste a spud not long out of the ground, you’re in for a savory treat. Our area farmers are offering mostly reds and yellows. Get yourself some smallish taters, two inches or so across, and roast ’em outside in your slow cooker. Wash and dry your potatoes. Put them in the crock, drizzle with the olive oil and sprinkle on the salt. Mix them up. Rub your garlic cloves with olive oil and nestle them amongst the potatoes. Some of the garlic might sneak down to the bottom but try not to let the cloves touch the crock. Rub your herb sprigs with olive oil and lay them on top of the potatoes and garlic. Roast on high for about 3 hours. The potatoes are done when you can poke right through them with a pointy implement. If they roast a little longer you’ll get crispier skins.